Father's Day is less than a week away. I'm sure it's fun for dads to receive handmade cards and the obligatory "World's Best Dad" mug from the kids, but every father deserves something extra-special from his wife on Father's Day. 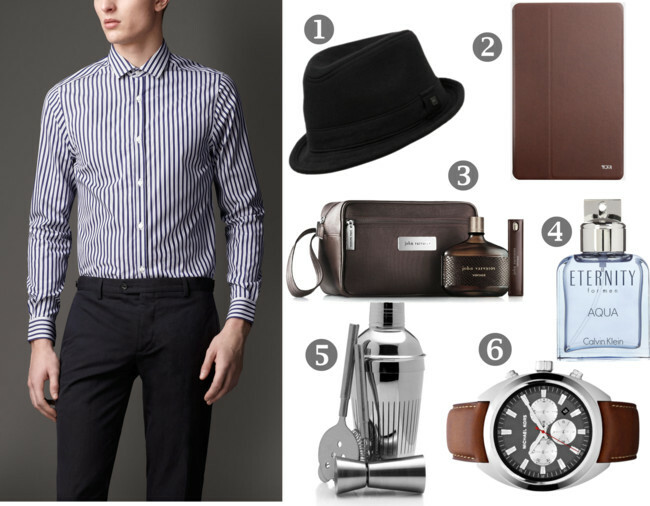 Some dads are more the techy kind, or the sporty kind, but today's gift guide for him is all about the stylish men - you know, the kind most of us wish we were married to. 1. Quiksilver Soho Fedora Hat - Every stylish man needs a classic fedora. A simple black one will match most looks. For summer, go for a straw fedora. 2. Tumi Tablet Case - Any Dad who owns a tablet will appreciate a sleek tablet case. The Tumi snap case has a built-in ipad stand and comes in a gift box. It comes in sleek brown or black, as well as a variety of bright colors. It's currently 46% off on Amazon. However, if it's still out of your budget, this leather tablet case with keyboard is just $24.99 and has great customer reviews. 3. John Varvatos travel bag - John Varvatos is a man's man kind of designer. If your husband takes frequent trips for business or with the family, he'll appreciate this John Varvatos Vintage Father's Day Gift Set that comes in a travel bag and includes a travel size cologne. 4. Calvin Klein Eternity Aqua Eau de Toilette For Men - Not all men wear cologne, but a stylish man surely does. My personal favorite is Acqua di Gio. It smells so heavenly, I'd even consider dating Gilbert Godfrey if he had that on. Then why, you ask, am I featuring Calvin Klein Eternity? Macy's is having a great special this week on it: If you buy any large bottle of Eternity for men, you get a free full-size Calvin Klein men's duffle bag. That's a pretty sweet deal. I'm sure any dad would love that gift as well. The large bottle is $87.00 at Macy's. If you just want to purchase the cologne by itself, you can get it on Amazon for just over $50. 5. "Cheers" Mikasa 3-Piece Cocktail Shaker Set - When I think of the ultimate stylish man's man, I think of James Bond, and then I consequently think of cocktails. If you and your husband like to entertain, he'll love a fancy cocktail shaker set or a cool whiskey serving set. Pair it with an expensive bottle of liquor. 6. MICHAEL Michael Kors Michael Kors 'Dean' Chronograph Leather Strap... - A high-quality watch is always a safe bet for a man's gift. It's kind of like diamonds for a woman. If he doesn't wear one yet, it's simply because he hasn't spent the money on it, but if he gets it as a gift, he'll love it. Michael Kors is such a classic American glam designer, he's who I immediately think of for a man's watch, unless of course you can spend $1000 on a Rolex...yeah me neither. My favorite is the Michael Kors Men's Dean Chronograph Leather Strap Watch. It's currently marked down about 20% and comes in both brown or black. For the Amazon sale price, there is only one of each left, so you have to be quick before it's gone. In the end, it's all about what your man likes. If he's more of a sports guy, get him some new hiking gear or fishing supplies. If he's the grill master in your neighborhood, get a grilling-themed gift basket or a shiny new grill. If he has a major sweet tooth, he'd be more than happy with a gourmet gift tower, and the number one no-fail gift for a man has to be a new set of tools. I have a handful of faithful male readers despite my predominantly female content. Speak up, boys, and leave a comment to let us know what you would want from your wife for Father's Day.